_____My goal with this article is to walk you through a bit of my process for creating tiling organic textures with ZBrush and Photoshop, as it evolved throughout the production of the Caravan Level of Uncharted 3: Drakes Deception. 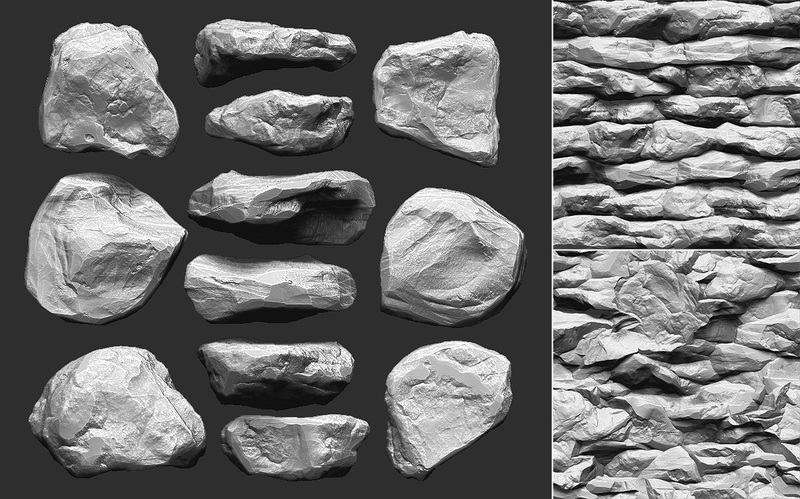 I’ll be demonstrating my process through the creation of a rock surface using source material I created, but these techniques can been applied to a variety of other surfaces. The goal here isn’t to sculpt a highly detailed unique rock model; instead we will be looking at creating a library of useful tool and alpha assets and how to use them to quickly assemble a variety of rock textures. While quality is of utmost importance, being able to work fast is critical in order to be able to respond to the changing needs of production. Very late in the development stages of the Caravan level, I decided to re-apply everything I learned during production and completely re-did many of my rock textures, materials and blending in order to get much better visual results. It was a calculated risk that paid off, but I couldn’t have done it without a solid workflow that allowed me to move fast and get predictable results. _____Reference: It goes without saying, but good reference is critical. Know which reference to use as well as which reference not to use in order to stay true to the characteristics of the subject. Stay organized and use photo viewers with databases for tagging and rating. When examining a subject or surface, try to simplify it. Similar to the construction of a drawing, break it down into silhouette and broad gestural forms, then into the smaller defining planes and finally the finishing surface details. Try to plan your work based on those assessments, they will help inform the creation of the tools you’ll need and right amount of details that will need to be on them. Usually the models will contain the silhouette and gesture, so the textures will need to compliment them nicely with the appropriate level of detail.Always be aware of scale and distance from viewer as they will play heavy roles in those assessments as well. _____Tools: I found that my best results came from arranging carefully constructed tools that I could use over and over again to carefully add and subtract as desired. If each tool is sculpted to have distinct looks from at least 4 different views then you can go far with just a few tools. Spend time creating these building blocks and save them to a library. It’s also helpful to poly-paint these tools before creating textures with them in order to get more variation in hue and value into the final product. If you need to just see light and value, you can keep your poly-painting intact by modifying the MatCap to ignore diffuse color by setting Modifier > OverwriteColor to 1. _____Now that I’m working in Zbrush for most of the texture creation process, my best normal maps came from careful attention to form and value. So being setup in a consistent, predictable manner helps me to achieve consistent results. I personally place much more emphasis on the sculpting of textures, than I do the color. If the form and cast shadow patterns aren’t both interesting and plausible, then it won’t make an interesting normal map and I won’t even start the diffuse color painting process. 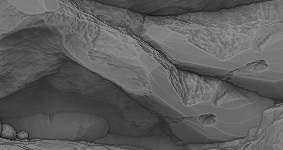 _____Light: The default light in ZBrush is pretty good for general vertical plane textures as is. However, I find it helpful to preview my work with more defined cast shadows than the default lighting offers; even if my final render is going to have softer shadows for texture construction. It helps me to judge z-depth and a tool’s placement relative to neighboring tools when dropping them to the 2D canvas. Regularly taking a Grabdoc of the alpha is another good way to evaluate and ensure consistent z-depth across the canvas. Attention to z-depth is also an important factor in blending should you use your height map for that. Aperture setting in the light palette. the same visual result yet work with the light palette. Cavity Detection & Classical Value Structure: While the cavity feature is very useful for many things, I prefer a more classical approach to rendering form in my direct pass. I like surface details to be saved for the light-side and shadow details to appear soft. I prefer to set up ZBrush’s cavity controls to lend a bit more detail to the light-side while keeping shadows softer. You can do that by giving your Cavity Radius a negative value, and raising your Cavity Diffuse just a bit. It gives a bit of light edging to the edge intersections of planes that add a nice touch to final diffuse textures. If I need one, I’ll render out hollow cavity passes later and blend these layers together to control light and shadow detail independently in Photoshop. 合併lighting : 在我開始製作我的diffuse color貼圖，我總是在psd內，取得我的light setup. 1. Something to control detail in the shadow-side. 2. Something to control detail in the light-side. My solution most of the time ends up being one of the Framer materials and a Gummy material; if not a custom material. will allow you more time to make creative decisions.In the layer stack below, all of the layer organization, grouping, blend modes, opacity, masks and settings were all done by an action. All I have to do is make sure the above 4 render passes are present and named properly. After it sets me up I can tweak my default settings as needed. Set Black Point: Determining the blend mode and percentage of each layer was actually pretty easy with a few basics in mind. Lighting passes like the direct and AO I prefer to multiply. When I’m determining the appropriate contribution from each layer I’m paying attention to 3 things: my black level, dark-light relationship and sharpness of detail (in and out of shadow). But probably the most important and first thing I want in place is black level, or my darkest shadow values. I want them dark, but I want padding in the shadow side of the histogram as well. 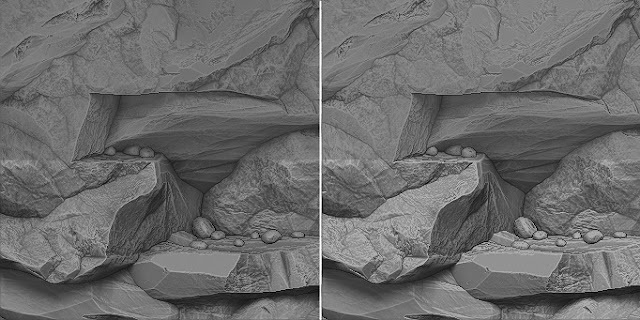 The detail renders are usually blended as soft light and weighted by the direct pass to control light and shadow detail. used in the same or similar lighting environments. 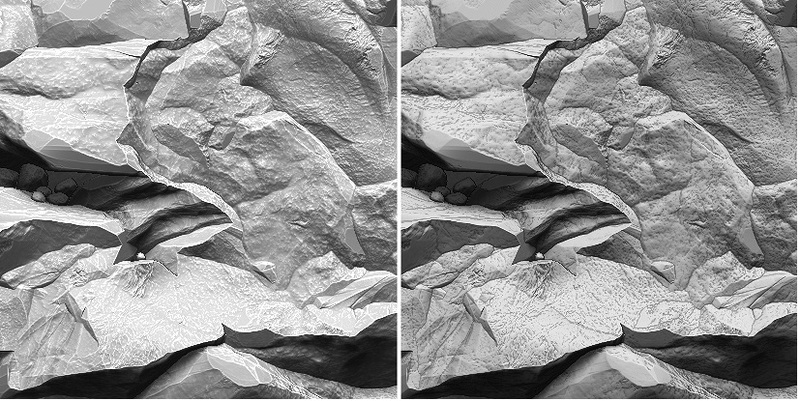 Weighted AO (and other layers): You can always spot an image that has had its AO pass multiplied over the combined lighting. It’s important to remember that the AO is part of the ambient lighting and should be treated as such. 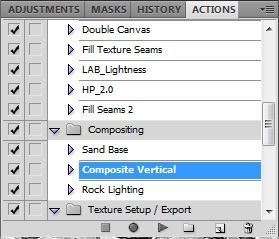 A simple example of a typical composite with combined lighting would be: ((Ambient*AO)+Direct)*Diffuse Color. The addition of the direct light greatly reduces the visibility of the ambient occlusion. So, for vertical plane textures I generally like to assume some kind of soft top-down hemispherical light source, and give a bit more light (and detail) to my Y facing texture planes. It keeps things still feeling natural, but makes things pop a bit more as you get more play between light and shadow forms. A simple technique used here is to just weight your AO multiplication by the inverse of your direct. ______Compare non-weighted AO (left) and weighted AO (right); both with and without shadow pass. Quick Diffuse Color Tips : Because I’m usually focused on creating interesting forms for normal maps, I don’t spend a lot of time working on a color map until I’ve checked out the normals in game and am happy with the sculpt. So in order to drop something in game fast I have a few go to techniques for quickly getting diffuse color and specular maps done for normal map evaluation. Depth & Crevice Color Layers : If I haven’t poly-painted the texture in ZBrush, I’ll usually quickly build up layers of solid color mixed with layers of pre-made tiling texture. I usually have sampled colors picked from reference that I’ll quickly build up through height map and AO masks. It allows me to work fast and iterate on the local color and texture detail. Detail Masks : A lot of times I’ll use whatever I already have handy like my AO render or the green channel of my normal map to mask detail. These can be used alone or combined in order to mask texture layers for grunge or sand buildup. A variation on ZBrush’s Outline material is good mask for quickly overlaying some edge detail. Using Materials to Capture Color Information: Getting color layers from custom materials can save a lot of painting time, and quickly achieve things that would be hard to paint. 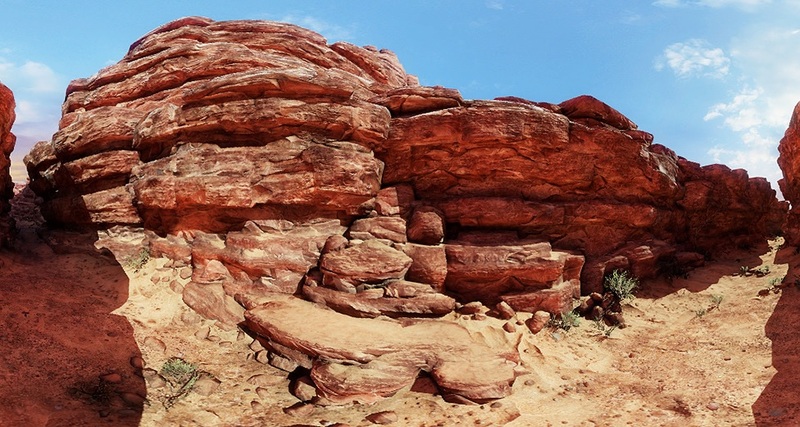 For example, a modified Gradient Map material can be used to get horizontal striations across the forms of the rock face. The Fiber material is also great for moss and grass. For larger grasses, the material can be modified through ZBrush’s shader layers to render custom normal maps and mattes as well. Color Correction: I often don’t get the color and value contrast set just right in these stacks to start, so I’ll always put some color correction toward the top of the layer stack. I prefer a single curves adjustment layer and like to adjust per channel to get subtle color shifts throughout the luminance range. It’s a lot faster than re-tweaking individual layers again. Even better, if I have a set of PSDs that are just variations on the same surface type, I can quickly update them all by simply updating my color correction if I need to; which I can also batch! 色彩校色 : 我通常不會只讓我的色彩和灰階對比在這些圖層中放置就開始，所以我總是擺一些色彩校色在所有圖層的最上方。我偏好一個curve adjustment layer並調整每一個通道，得到輕微的色彩變化遍及整個光罩區域，這比微調每一個單一圖層快上許多。更好的是，如果我有一組PSDs，只要換掉同樣外表的種類即可，我可以快速更新他們，藉由我的CC(如果我需要)，而我還能打包! A modified version of the GradientMap material and a custom texture were used to create a mask for horizontal striations that follow the forms of the rock face. Custom Fiber materials were used to render passes for grassy top planes. Quick Specular Tip : A simple thing to do in order to get a fast specular map is to use the Channel Mixer Adjust Layer. Set it to gray and move the sliders to get the best balance of even lighting and detail contrast. The best part is that it’s non-destructive and keeps doing its thing; so if I have it inside of a group above my color group, then every time I update my diffuse map to check it in game, I can quickly re-export an up to date, matching specular mask. 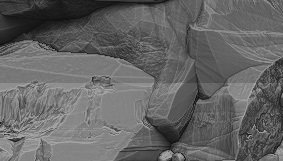 For textures with a wider color gamut that need finer tuning, another useful tool is the Black & White Adjust Layer. These two adjustment layers can easily get you 75% of the way there.